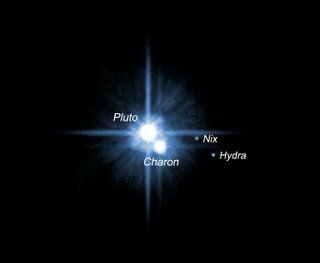 You probably remember the confirmation of Pluto's two new moons back in February this year. At the time the moons were confirmed they went under the imaginative names S/2005 P 1 and S/2005 P 2. Now the have been given 'proper' names. The inner moon is called Nix and the other moon Hydra. On the subject of Pluto and following my post the other day on what is a planet, it's worth noting that the BBC Horizon programme tomorrow night (BBC2 : 2100hrs) is covering the debate over what the definition of planet is. The programme is provocatively titled "Bye Bye Pluto". Thanks to Stuart for pointing that out for us.